Mountain UltraLight: Barefoot Hiking - Torture or Bliss? 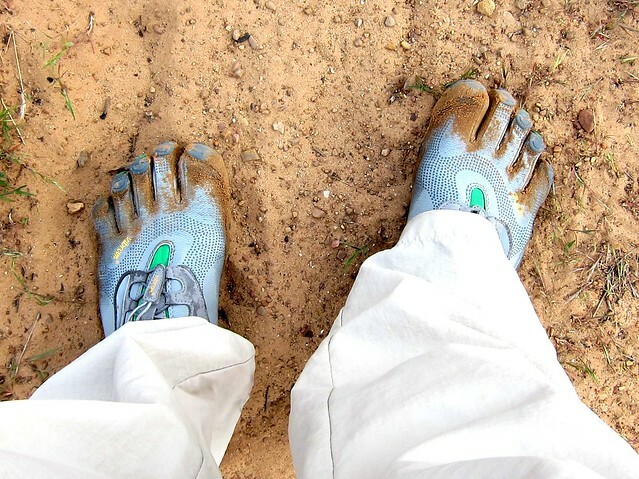 I've been wanting to check out the barefoot hiking experience with a pair of Vibram FiveFingers shoes for some time now, but I don't tend to like the feeling of a strap across the top of my foot, so I have never parted with a hundred bucks to check them out. A combination of my REI dividend burning a hole in my pocket, and the introduction of Vibram's new lace up Bikila LS Running Shoes was all it took for me to finally take the plunge. My Men's size 45 weigh just 13.4 ounces for the pair, less than half of what my trail runners weigh...a huge benefit for a gram counter like me! They recommend you don't over do it when you first start wearing FiveFingers because the muscles you use in these are different than in "normal" shoes. Heeding their warning, Juggy and I went on a little 6-7 mile hike the day after I bought them. The unique experience of walking through trails "barefoot" was pretty cool, and afterwards my feet felt fine. The next weekend I decided to walk a little farther, and took one of my favorite routes through Red Rock from my It's Just Walking post a while back. I figured that this would be a good test because it consists of walking on a rocky trail, 9 1/2 miles out then back. If my feet were starting to feel sore, I could simply turn around and cut it short. When you first slide your feet into them, the shoes feel a bit weird, but that's because you're used to having your feet jammed inside "normal" shoes all your life. Once you start walking they feel very natural, and you end up walking quite differently...softly is the best way I can describe it, like when walking barefoot. 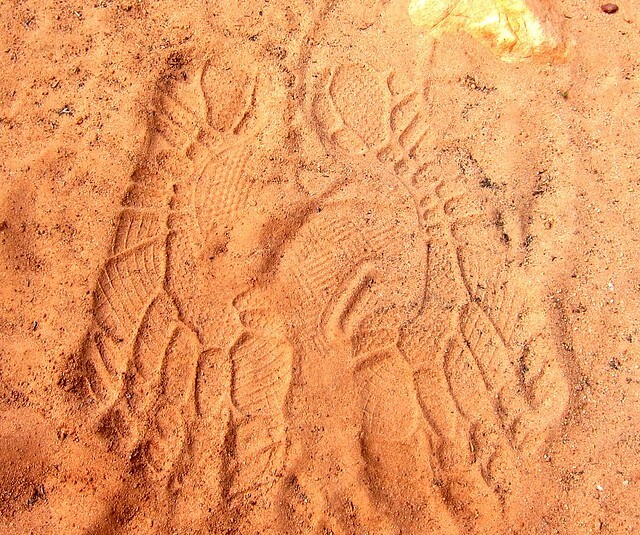 They leave some very cool foot prints too! These shoes are very much at home in water, and you might find yourself walking right through stream crossings rather than hopping across the tops of boulders. The dirt that collects on the wet shoes is not bothersome and falls off in short order. One thing about these shoes is that you feel everything, which is both good and bad. The good part is that you feel much more stable in technical sections because the soft soles help your feet mold to the terrain. 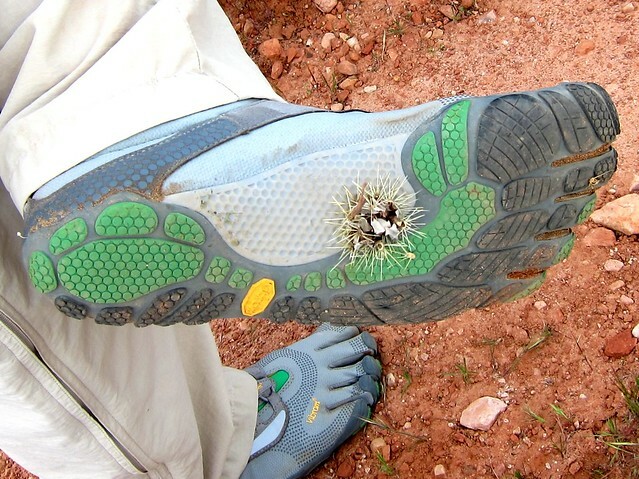 The not so good part is that the thin soles are subject to letting thorns and such through easier than with running shoes. At the 8 1/2 mile point, my feet were starting to get sore, so I decided to turn around. Part of the soreness was from hitting a rock quite hard with my little toe about 4 miles into the hike. I didn't think much of it at the time, as I knew it wasn't broken, but it did bother me the entire way. As I passed the 12 mile mark of my 17 mile day, the bottoms of my feet were getting more and more sensitive. I walked slowly and softly, and took several breaks, especially at stream crossings to soak my sore feet. The last couple of hours were rough, and with each step the pain increased. I took my time and eventually made it back to the trailhead, but I definitely stopped having fun towards the end. Removing my shoes once I got home, my toe looked worse than I thought it would. This photo is from the next day, when I woke up with it swollen and brightly colored reminiscent of Red Rock. The photo below shows a hole in the little toe pocket, and the rubber starting to separate on the big toe. I was disappointed to see product failures like this so quickly. So I am planning to return my goofy looking new shoes. If they had lasted longer, I probably would have kept them for lighter hiking, water activities, etc. I'm not sure why they wore out so fast...maybe I'm just too hard on my footwear, but my Foot Pillows sure didn't wear out like these did! It's too bad, because I got some great reactions wearing these...from conversation starters, to little giggles, "ewww", and my favorite comment from a buddy "You know how I can tell you're gay? Look down." To be fair to Vibram, these are street running shoes, not trail running, but I have successfully used regular running shoes on trails many times. I strongly suggest you do not use these for trails if you are clumsy like me and kick rocks or step on cactus off fall. With a swollen foot and burning calves, my body is not very happy with me right now. Luckily my injuries are minor, and I should be back to hiking next weekend. In my trail runners! I see a lot of trail runners in the hills around here wearing these and they always seem to be moving faster than me. I would be really interested to see how they perform on technical alpine terrain or if they'd be too soft to climb in. Thanks for the honest review! I must admit I'm leery of these "shoes." even more after reading this post! Besides...It looks like you would be stepping on the hem of your pants the whole time! Thank you for your review, John. I really appreciate your sharing your experience. In 2009, I hiked the first 70 miles of the John Muir Trail from Happy Isles in Yosemite exclusively in my V5Fs KSOs with my daughter in her V5Fs Sprints. We both carried average 38-40# backpacks. Like John described in his review, I also maimed both my pinkie toes, and ultimately my feet and legs swelled to the point I was forced to exit what had planned to be a thru-hike. My daughter, on the other hand, had a totally successful experience with no downside. Previous to the JMT trip, we had trained over the previous 6 months backpacking in the V5Fs and were well-accustomed to their advantages and limitations. I am small-framed, have high arches and hearty, yet delicately boned feet. My theory is that carrying the weight of 38-40 pounds on my small frame over the 70-mile distance began to force my arches to drop, as they were not supported enough by the V5Fs. And, it could have had nothing to do with the V5Fs . . . who knows? They were great for stream crossings and for uphill climbs, very grippy and connected to the earth/stream bed. Less so for the pounding long descents over granite. They got the full test through the sandy, rocky, meadow, aspects of the JMT. I left them behind in 2010, but am considering taking them again this year on the JMT, as an interim hiking shoe . . . some relief from my boots on the trail. Thanks for your insightful comment! Sorry you had to cut your 2009 JMT Thru short. My wife, son, and I are thru-hiking the JMT for the first time this summer, and I will be doing it with my trail runners for sure. It's just too dangerous to risk hurting your feet out there, and in my opinion the risk does not outweigh the benefits. My base weight will be around 8lbs, total pack weight 12-16lbs, which will make it much easier than carrying a more traditional load. Anything I can do to help you lighten up, just let me know! Great photos, John. Sad to hear that your experience wasn't positive, and of course not nice to see the shoes fail so quickly. I think you over-did it a bit, a shorter hike in less demanding terrain would have been the right approach, in my opinion. You also could have carried a back-up pair of trailrunners with you, this being your first outing with them. My experience is different, I really like the VFF KSOs I have, and plan to use them as much as possible in the coming summer, both for backpacking, everyday life and packrafting. They just are perfect for me, and while I enjoy my Inov-8s, the VFFs are in a league of their own. Certainly not the first time that I have seen toe injuries like yours in VFFs, but thanks for posting this - I don't see enough talk about this issue. Merrell 'Glove' series - very close to a 'no toe' version of VFF. New Balance Minimus/Inov-8 f-Lite 195 - these have 3-4mm of drop (0 with VFF and shoes above) and are both quite popular right now. I've been hiking and backpacking (25lb pack) in VFF Treks all last year. I loved the experience except that after 8-9 miles my middle toe on my right foot would start hurting. I don't think it is the shoes though, just the anatomy of my foot. VFF's take time to get used to. I've been wearing them for a couple of years now. The bottom of my feet do not get tender and I love how my foot 'wraps' around the obstacles instead of trying to balance on them in regular boots. If not for the middle toe and the insane snow in the Sierras this winter I would be taking my Treks on our 200mi backpacking trip this summer. I totally agree I over-did it for my second time using these shoes, and the fact that my feet got sore and tender was my fault. If I had worked up to it over time, my feet would have been able to get used to the minimalist type of shoes. The reason I'm abandoning them is 1) the lack of protection is why my little toe was injured. I don't want to risk a worse injury out in the middle of nowhere. 2) if they had not begun to fall apart so soon, I would have kept them for light hiking and water sports. Thank you for the tips...I do want to try some other types of "barefoot" shoes and will check out your suggestions. I too love the feeling of my feet wrapping around obstacles, which lightweight running shoes do a much better of job than boots, but these minimalist type of shoes make you even more stable. My son is 15 too...how cool is it we have kids that are intsted in this great sport?! It would be great to run into you out there! I have had much better experience with the regular KSOs over the Bikilas. Although the KSO has a thinner sole, I have had mine over two years and they still are in great shape. I think the KSO Treks, with their Kangaroo leather uppers would also prove to be quite durable. I think that a more gradual build-up of mileage would have been of great benefit to you. In addition to soreness, I have found that when I am tired, my feet will have more of a tendency to kick things. Very nice review! Thanks for sharing. I have been wanting to get a pair of these to try out as well for quite a while, but like you was not to keen on dropping the $$$ to do so. Eventually I will. I knew I was pushing the mileage in these new shoes, but thats what I wanted to do. 17 miles is not a long distance for backpacking though, and because of my toe injury I've decided to get away from the VFF shoes...what if I had been way out and broke my toe instead of bruised it? I know many love the VFF's, but I don't think they're for me at this point. Thanks Stick, it sounds like others have had better luck with KSO's, so you might try them. For me, I just picked up a pair of Merrell Trail Gloves which I intend on thoroughly testing at Zion National Park this weekend. They are very light, have great toe protection, and still feel "barefoot". Wish me luck! @John In addition to the fact that you were using a shoe designed for street running instead of the one designed for trail running (VFF Trek Sport or KSO Trek) I'd suggest that there may be another issue at play here: You simply can't walk the same way barefoot (or in barefoot style shoes) as you can with hiking shoes, and I'm not just talking about using different muscles. Walking barefoot requires notably more concentration. You have to pay much more attention to where you are placing your feet. Over time you develop a better sense of the ground and can more easily place each foot and react to what you find under it much quicker. However, when swinging your foot forward into a hard surface before putting it down (stubbing a toe) there's really not much that experience can do to help, although the better sense of where your placing your feet *might* have prevented it. As for the construction problem, I don't think it would have mattered what model you chose. It appears that the method of attaching the cloth to the rubber is the same on all of them. For someone who's running around amongst rocks and cacti I might want to go with the KSO Trek's. The kangaroo upper would probably wear better. My advice is to not just wear barefoot shoes for hiking. Wear them constantly. Re-teach your feet the lessons of balance, placement, and adjustment that they forgot when you stopped going barefoot as a child. @anonymous It's probably safe to say that your fallen arches had nothing to do with the VFFs as many people have reported a significant strengthening of the arches when switching to barefoot style shoes. Also, I *believe* (could be wrong) that fallen arches was never such a problem prior to Nike's advent of the running shoe, which resulted in the big squishy soles we now all seem to "need"
wouldn't it make more sense to acknowledge that conventional shoes are designed the way they are for good reason, and stop generating lame excuses as to why the trendy footgloves just don't cut it in the real world? ... just a thought. what about kenyan runners who have never put a pair of any kind of shoes on in their life? Look it up..
Anon, I've thought that they might be a fad as well, but time will tell. There are plenty of good arguments against conventional shoes, and I think for many, the barefoot shoe craze fills a need. I do know that the minimilist type shoe has helped me with tendinitis problems. When I first started to wear them I could hardly walk without limping, very shortly after, the tendinitis much improved. But, I do also know that my husband says something similar to what you are, that he just doesn't feel completely safe in them hiking. (the five finger vibrams) There is a lot of research for runners, about injury and modern running shoes that is pretty convincing. 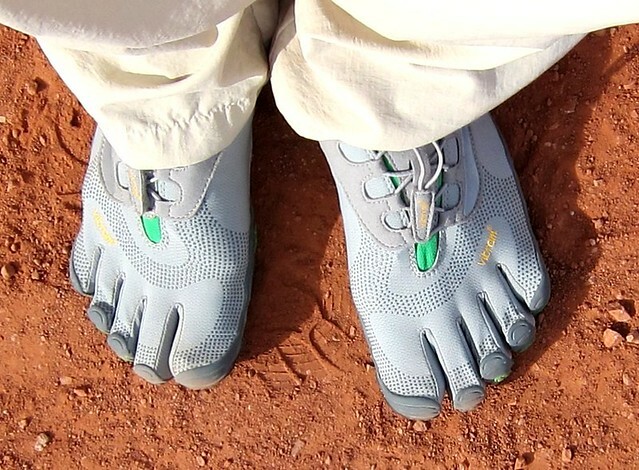 Ive been using my Vibrams Trek sports for all sort of out door activities from short hikes, Kayaking, camping etc. They are showing no physical damage and have been a phenomenal experience. For the concerns that you and others have mentioned I don't use them for trail running or long hikes. I have recently purchased a pair of Vivo Barefoot's that are amazingly sturdy and comfortable. Give them a look. Thanks for the tip Steve, will do! Maybe this is light hiking compared to your usual, but you've done way too much too fast with the VFFs. Start with very short distances, <1 mi. When that feels good, work you way up gradually. You will be using unfamiliar muscles, and this is the way to avoid injury. Once you learn to use your feet without the aid of padded shoes, you will find much enjoyment in it. I think the wear aspect is simply due to a weight issue - unfortunately shoe material doesn't usually thicken with size which means a size 7 has the same thickness as a size 13 - so essentially you are transmitting what 225-240 pounds into a shoe probably designed for a 120 pound person originally. You add height into that which is a force multiplier and you are transmitting much more strain to the material as someone else. My point is these may not be the best developed for larger people so find a deal on a pair and but twice as many or follow the break in for your stride a little closer and not tear up shoes as fast perhaps. I've just bought myself a pair of Merrell Barefoot True Glove... 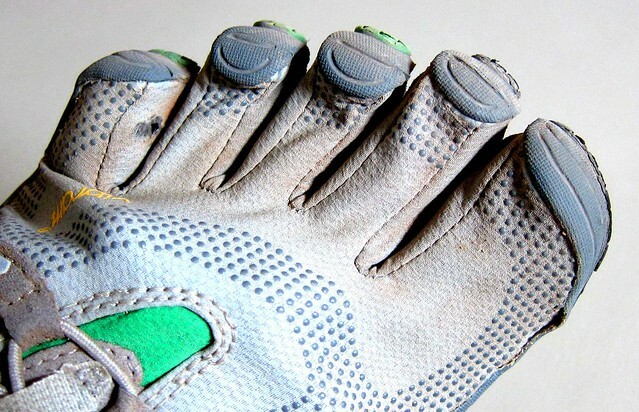 I had a look at the FiveFingers but they looked a bit too freaky for me. I'll be trying them out on a hike within the next few weeks, so I'll post on my blog about it. I hope they don't fall apart as easily as the FiveFingers! Thanks for the post! I've tried nearly all the barefoot shoes, returned several of them and kept the rest. I am sitting comfortably right now in Merrell Barefoot Gloves - street running shoes that I often work out in. I've discovered that, with barefoot shoes, your feet take a beating faster, but also over time, get stronger. I ache less after a barefoot hike than a regular hike. I've learned to cope with the "beat up" part over a long hike by using a carabiner to hook a second pair of shoes onto my belt. Switch up shoes mid-hike relieves the aching strike points. My favorite hikers are these J-41 barefoot hikers. http://www.6pm.com/j-41-vanguard-barefoot-tan-coral The top is mesh and so they expand with your feet as your feet succumb to the hike. The insole is a very thin bit of memory foam. My feet are always so happy to have that tiny bit of cushioning, and it does not interfere with the "ground feel." 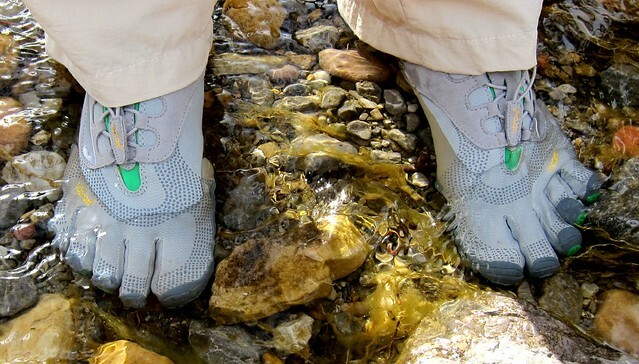 They also dry out quickly, and like the five fingers, you can walk right through streams in them. There is no treat for beat feet like cool stream water. I just did my first 14er, Torreys Peak outside of Denver - a terrible, boulder-strewn 9 mile hike. Even though it was by far the worst hike I've ever been on, the shoes held up and I did not even need to change out of them. I have other favorites too: Vivobarefoot Breatho Trail, Altra Zero Drop Eve (not a hiking shoe), and the "other" toe shoe - Fila - which I like because it groups the baby toe together with its neighbor, leading to fewer baby toe injuries than in my five fingers, and an old pair of Teva Wraptor Sandals that are zero drop but not barefoot style. Anyway, my point is, try all the barefoot shoes till you find the perfect pair for you! My feet are so much happier in minimalist shoes. I'm not going back. You chose the wrong tools for the job. The five fingers are not hiking shoes but street running shoes. The sole is thin , thus thorns could get through and there is no front fingers protection cause they were designed for streets. Each job needs its right tool , and there are many barefoot shoes that were designed for trails , such as the Merrell Sonic glove which I am using - they have a thick and strong front protection in case you'll hit rocks and the sole is abit thicker so small sharp rocks ad thorns won't cut through. I've been wondering how these type of "barefoot" shoes would hold up on a hike. I don't see any major advantages of minimalist footwear over going full-barefoot. And I imagine the sensation is very different. Haven't had the chance to try them out, but I used my "running" VFFs on Lynn Peak in Vancouver, and they held up great. I'm thinking maybe you just got the wrong pair. Mine I've had for 4 years now and they still look great! I'm actually looking at buying another pair today! 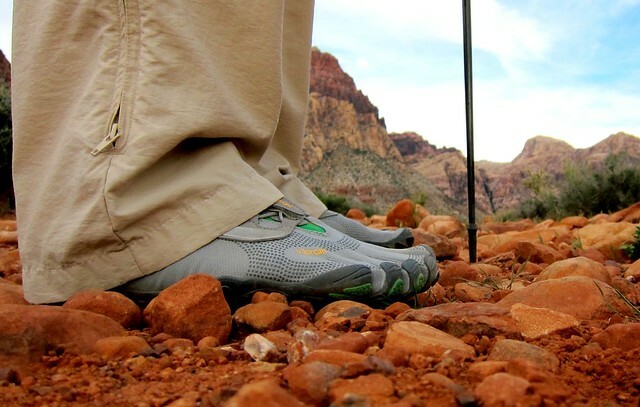 Hiking shoes are similar to running shoes, except that they are made with sturdier material. This is to ensure that your feet are duly secured as you pass through different textures of land and water. You can visit our site for the best hiking shoes for men.